There is nothing worse than a clogged toilet! The fear of overflowing water when its flushed is almost too much to handle! As any parent will tell you, there are all kinds of unexpected items that can cause a toilet clog (in addition to the expected waste!) Crayons, washcloths, toys, pacifiers – somehow, no one knows how they make it into the toilet or get flushed. When you plunge the toilet or take it apart in a home with children, there’s a good chance you’ll find any number of these things. Thankfully, most clogged toilets can be resolved with a little elbow grease and your trusty plunger. Other common toilet solutions involve an auger (otherwise known as a toilet drain snake). Plungers come in three different types; the most common is the red-tipped plunger with a cup on the end. The cup plunger is ideal for clogs in sinks and bathtubs as it can create a seal around the flat surface and push or lift the clog out of the way. A flange or accordion plunger are specially designed to create suction within the toilet. Augers are a handy clogged toilet solution when plunging doesn’t work as intended. The auger will have a crank on one end, and a flexible cable on the other. To auger toilet, you push the cable into the hole in the bottom of the toilet and turn the crank to start unclogging main drains through toilet flange. 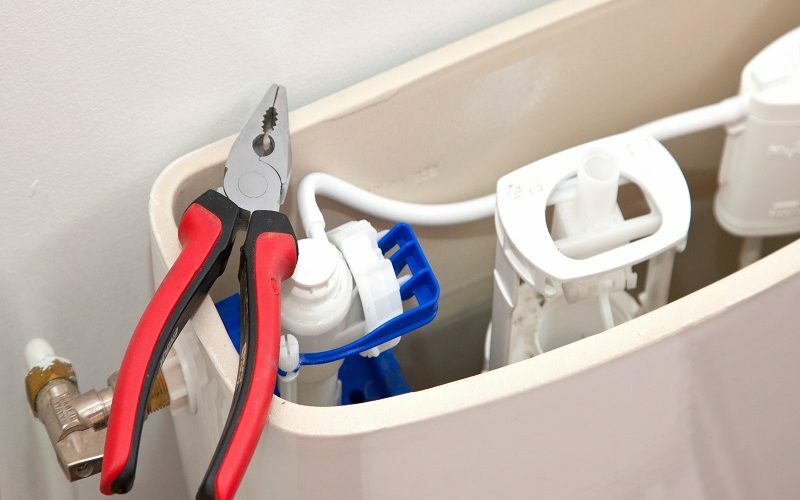 If you flush the toilet and the water moves slowly down the drain or fills up to the brim before slowly draining back down – you probably have a blockage in the waste line or poor venting. When flushing a slow draining toilet, listen for sounds in nearby drains. If you hear gurgling, it usually means there isn’t enough air in the lines for the toilet to flush correctly. Find the vent on your roof and clear any debris from the opening. Use a garden hose and spray water into the vent. If the water comes back to you, clear the vent pipe as well. You can rent a sewer auger to get the job done. If your toilet is clogged, you can try to clear it with a homemade solution of baking soda and vinegar. Add one cup of baking soda to your clogged toilet. You may need to add boiling water to the toilet bowl. After the baking soda has sunk to the bottom of the toilet, add two cups of vinegar and let the solution sit several hours or overnight. Plunge if there is still water remaining in the bowl when you check it and then flush. If your efforts to unclog the toilet are not working, you may need to contact a professional plumber to unclog the septic line. When you’re looking for a cheap plumber in Toronto, call us! At Cheap Plumber, you can be sure that you are working with licensed and insured plumbing professionals. We understand that it is important that you have the quality guarantee that this brings with it, and we would not expect our clients to compromise on this.